Long , long ago there was a little red hen. She had made a little house for herself in a jungle. She lived there all by herself. She worked throughout the day to keep her house neat and clean. Every morning, she went out to collect sticks for fire. Note very for from the hen's house, there lived a fox in a den underground. He lived there with his mother. The sly young fox's mouth watered whenever he saw the little red hen. He thought she would make a delicious dinner. He tried many tricks to trap her but the clever hen always escaped from his jaws. One day the sly young fox hit upon an idea to catch the little red hen. He asked his mother to put some water on the fire to boil. We shall have the little red hen for our dinner tonight,'' he told her mother as he left for the place where the little red hen had her house. Soon he reached the place in the jungle where the hen lived. As he approached to the house of the little red hen, the sly young fox hid behind a tree. The heed did not notice the fox s she came out of the house to collect sticks for fire. She did not shut the door of her house as she did not find anything foul. As always she moved away from her house collecting sticks. As soon as she was out of light, the sly young fox quietly got into her house. He hid behind the door of the house and eagerly waited for the little hen to return. After sometime, the little red hen returned with the basket of sticks. As she entered her house, she found herself face to face with the sly young fox. She had never expected the fox to be inside her house. The sight of he fox sent a chill through her spine. 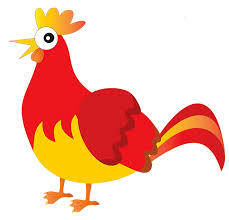 The frightened little red hen threw her basket full of sticks to a side and flew up to a high beam in the house. She took a sight of relief as she know the fox would never he able to catch her. The fox was helpless. He tried hard but could not reach her. But he had decided to kill her. The fox did not leave her house. He kept sitting there watching the little hen with prying eyes. ''How long can she keep hanging there? She will have to come down sooner or later,'' the fox said to himself. But the sly young fox had too decided not to go back home without her. He sat there making plans to catch her. ''What are you thinking, ''the fox was disturbed by the voice of the little red hen. ''you are wasting your time. Go back, ''she repeated. ''You just wait and see, ''replied the sly young fox with a grin. He got up, picked his bag and put it under the place where the hen was sitting above. And then, he began to run round and round in circles. The hen watched him intently as he did all this. He cannot stay here for long. He will go away when he is tried'' the hen said to herself. But she was wrong. The fox seemed to have found a way to trap the hen. The fox increased his speed. He went round and round, faster and still faster. The little red hen did not understand what the sly young fox was up to. She was amused to see the fox chasing his own tail. The little red hen intently watched from above the beam the sly young fox doing the rounds. As he kept pace with the fox's movements, her head too started spinning. Soon she started feeling dizzy. She could not keep her balance on the beam any more. She came hurtling down, straight into the fox's bag. The fox was in fact waiting for his moment. As soon as the fell into the bag, he closed the bag. I told you to wait and see, didn't I?'' the fox told the little red hen as he singed the bag onto his shoulder. The hen inside the bag kept quiet. She however, still hoped for a chance to escape from the clutches of the wicked fox. The exercise at the hen's house had made the fox really tired. In the hot noon, he was finding it difficult to walk. So as soon as he saw a shady place under a tree on the way, he decided to sit for a while and take rest. He kept the bag on t side and lay himself down. Tired as he was, the sly fox was soon fast asleep. The little red hen inside the bag was waiting for this opportunity. She came out of the bag. he quietly collect some stones and put them in the bag. Having done this, she ran back to home. Not knowing what had happened while he was asleep, the fox picked up the bag and walked to wards his den, inauspiciously. The little red hen really heavy he thought with a smile on his face. She would make a really tasty dinner. Yes it is, son said the mother licking her lips. As the sly young fox emptied the bag into the boiling water, stones in place of the hen, filled the boiling water pot. The boiling water splashed all over the son and the mother. Soon both of them died. The little red hen had by now reached her house. Never did he see the cunning fox again. She lived in peace ever after.